Google updates the G Suite Developer Hub, continues its mission to invest and enhance the G Suite developer experience. Google has been constantly offering new products and services to improve the developer experience and keep programmers happily plugging away on their platform. 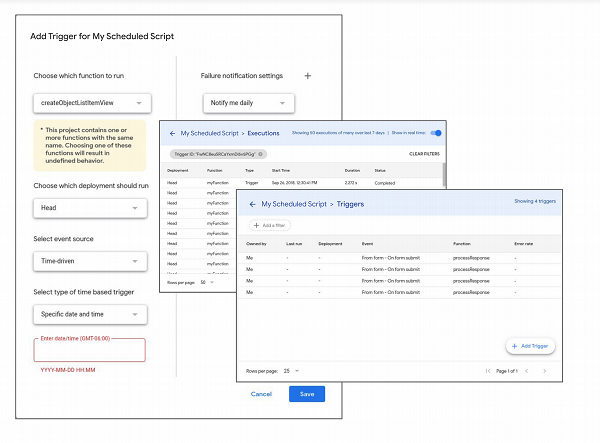 The latest comes in the form of the G Suite Developer Hub, a rebrand of the Apps Script dashboard with exciting new functionality to help start new automation script and better manage existing ones. The G Suite Developer Hub, first revealed at Google Cloud Next, is home to Apps Scripts projects of all varieties and now also supports projects for Google’s App Maker. It provides a variety of templates to help to start a new Add-on project for Docs, Sheets, Forms, Slides, Gmail or Hangouts Chat. The hub also makes it easy to build App Maker apps, providing access to a variety of templates that help jumpstart your development process. The new Hub features a new trigger management UI, to help developers get a better overview of the various triggers they’ve created across all projects instead of one project at a time. You can create and modify them as you deem fit, during any project. Another feature is a new real-time executions view, which allows you to see exactly when various apps get executed, without having to refresh your browser. According to Google, an introduction of the G Suite Developer Hub continues its mission to invest and enhance the G Suite developer experience. The company first announced the Apps Script dashboard earlier this year. Since then it has added an Apps Script API for managing Apps Script source files, versions, and deployments, as well as an Apps Script Command Line Interface for easy access to the Apps Script API.